It’s already F-I-V-E more days to go before Christmas Day! I can’t wait to take a quick rest day after I did all my holiday shopping, decorating, gift wrapping, menu planning and all the Christmas nitties-gritties. Now all I have to do is get myself ready for the Christmas celebration – mentally and physically. 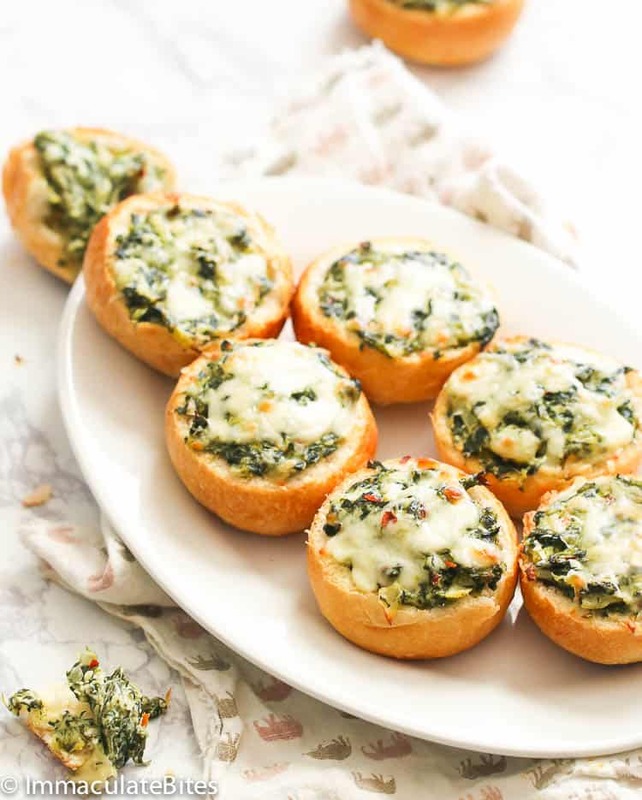 For today’s recipe I’m sharing with you one of my easy party dip for the holidays – spinach dip! If you’ve noticed, I’m kinda going here for a rather “healthy-ish” dips for this season like this Refried Beans here. This spinach dip here is one of the easiest dips to put together and it’s highly possible that you have all the ingredients sitting in your pantry or fridge/freezer. PLUS, you don’t need to buy any sort of seasoning pouch mix to elevate the flavors in this easy dip. 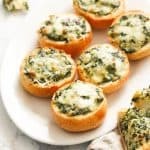 To make an incredible spinach dip, I use a mixture of sour cream and cream cheese for a pleasant tartness and slight sweetness on top of parmesan and mozzarella cheeses. And you know how my homemade Creole seasoning is better with just anything; so I added a teaspoon of it for some layers of flavors and red pepper flakes to seal the deal. 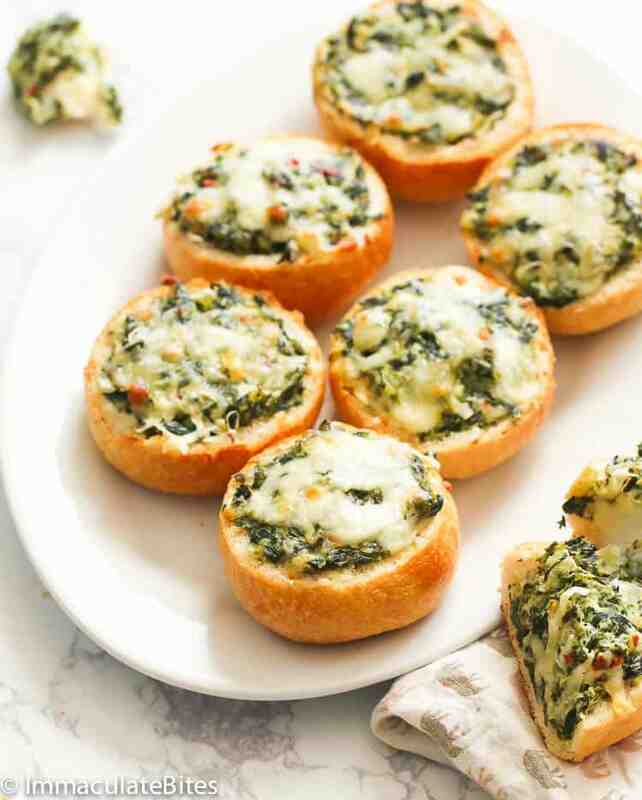 Making this spinach dip is as easy as 1..2..3. You start off with sauteing your onion and garlic first. 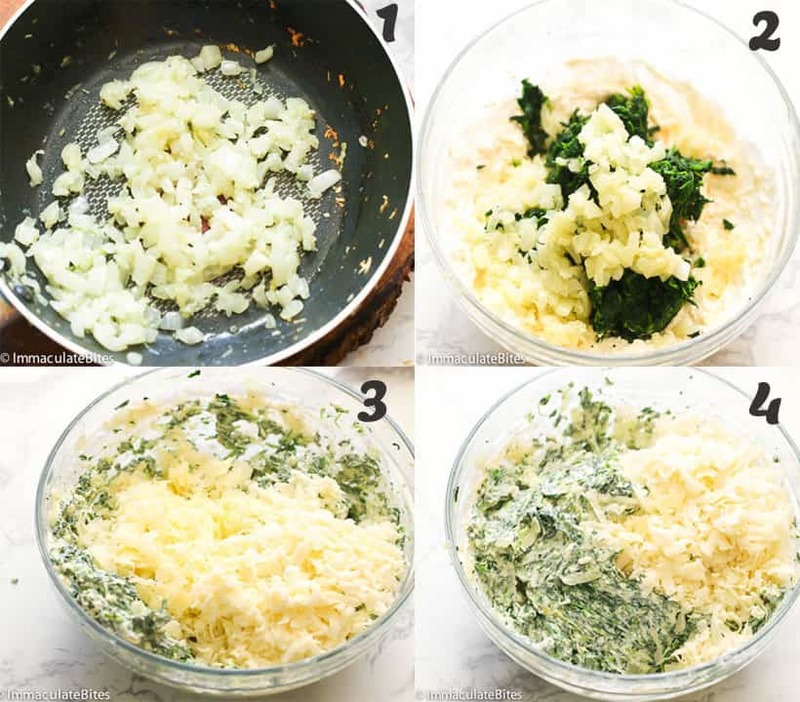 And in a bowl, you mix all the ingredients: cream cheese, sour cream, mayo (combine well), followed by thawed spinach, the onion mixture, and cheeses. Mix them well and season with Worcestershire sauce, Creole seasoning, pepper flakes, salt and pepper. Continue mixing until thoroughly combined. You can serve it at this point and serve it to your guest, OR spoon spinach dip into your prepared rolls. Top them with mozzarella cheese for a beautiful cheesy topping and pop it right in the oven. That’ll be the easiest 30 minute of your kitchen journey. 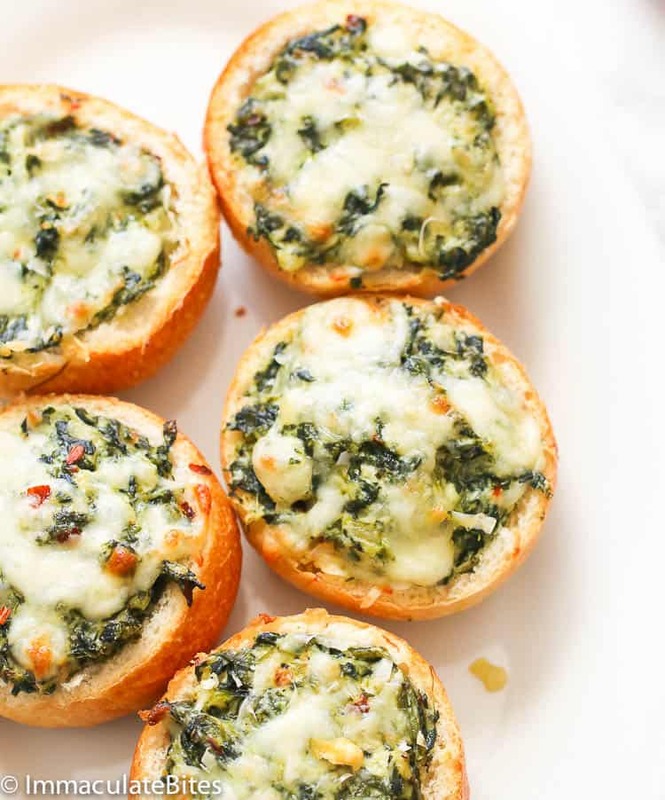 Can spinach dip be prepared ahead of time? Since it’s easier to prepare party treats the night before rather than winging it all on the day of event, I totally understand why we do want to get off some tasks off our plate. So to answer your question, yes you can absolutely prepare this spinach dip a day in advance. Just simply mix it all up, cover and refrigerate. It’ll stay good in the fridge for up to three days. As for freezing it instead…mmmmm…I don’t recommend it as the sour cream mixture would break down a bit when thawed. If you’re inspired to throw a little party prior to Christmas or New Year’s Day, you can include this crowd-pleasing spinach dip here. Serve it with crackers, veggies or even chips. Trust me, you’re friends and family would gather around this party treat here. Add this sausage balls and beef sausage rolls for a variety of tasty appetizers to entertain your guests. Store any leftover dip in an airtight container in the fridge for up to three days. 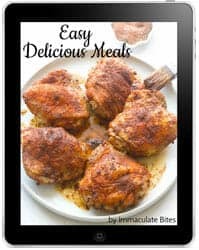 You can serve it with favorite veggies like carrots, cucumbers, radishes, broccoli, cauliflower, celery and red, yellow and orange bell peppers. You can use fage Greek yogurt instead of sour cream. Dip is best served when warm. It could last in a room temperature for 3 hours, after that you can reheat it in the oven. As always, please use your best judgement. To substitute frozen thawed spinach with fresh spinach, use two pound of fresh spinach leaves, steam it in a sauce pan with 1/2 cup of water and squeeze dry with a clean kitchen towel. Proceed as directed in the recipe instructions. Preheat oven to 350 degrees. Slice top portion of bread roll and remove the inside of the bread; set aside. Place a small sauce pan over medium high heat, add oil followed by onions and garlic; saute until soft about- about 2-3 minutes. Set aside. In a large bowl, add cream cheese, sour cream and mayonnaise. Thoroughly combine. Stir in your spinach, then the onion mixture. Then add mozzarella and parmesan cheese, mix. Season with Worcestershire sauce, Creole seasoning, pepper flakes, salt and pepper. Continue mixing until well combined. 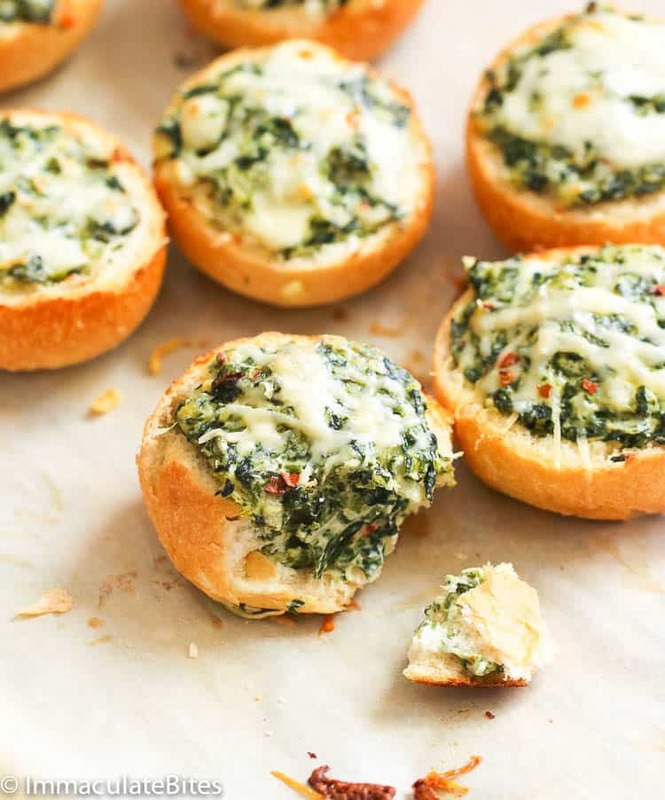 Spoon spinach dip into your prepared rolls and top with remaining mozzarella cheese. Bake on a baking tray at 350 degrees F for 12-15 minutes or until cheese is melted and bread is heated through.